It’s no secret that nationally-ranked La Salle Academy is the odds on favorite to capture the state title this Sunday at Ponaganset. But who will break the tape at the finish? Could the Rams’ D.J. Principe become the first sophomore to earn gold since Cumberland’s Jerry Bonner in 1998? Will teammate Jack Salisbury, the early-season favorite, have enough in the tank after being sidelined for nearly two months with a quad injury? How about Hendricken’s Mike Potter? Can he make his wish come true from this past summer by giving the Hawks their second straight individual champion? La Salle Academy wins first state title since 1983 with impressive 25-43 win over second-place Hendricken. 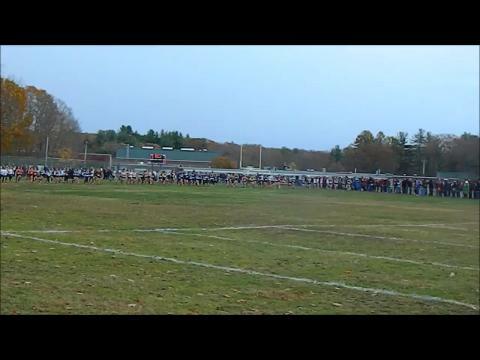 Ram boys and girls take team titles at R.I. Cross-Country Championships. La Salle girls win second straight title, while Barrington runner makes it three in a row at State Meet. With the use of MileSplit's data base, the evidence is clear that La Salle Academy has potential to dominate the field at this Sunday's state meet. The Rams top five scoring runners averaged an impressive 18:25.19 for the 5K distance. North Kingstown is No. 2 on the list averaging just under 20 minutes. Complete results available to subscribers of MileSplit Insider, about $1 per week with a yearly subscription. Are you wondering who have run the fastest times on Ponaganset's covered-bridge trail, home of the class and state championships? We have it here. Thanks to Bishop Hendricken coaches James Lourenco and Daniel Brennan for this list, the 50 fastest all-time R.I. girls' performances. Five of the top 10 runners in Sunday's state meet will be on the starting line. Are you wondering who have run the fastest times on Ponaganset's covered-bridge trail, home of the class and state championships? We have it here. Thanks to Bishop Hendricken coaches James Lourenco and Daniel Brennan for this list, the 50 fastest all-time R.I. boys' performances. Eighteen different runners have gone under 16 minutes since Hendricken's Adam Moitoso won the 2003 state meet with a 15:48.2 effort. Thanks to our crazy data base, we have a ranking for all 45 teams in our system with their top seven individuals. You guessed it! La Salle Academy leads the list with their top five individuals averaging an impressive time of 15 minutes, 38.41 seconds. The gap between its first through five runners, a mere 18.42 seconds. Bishop Hendricken is No. 2 and Cumberland is No. 3. Complete list available to subscribers of MileSplit Insider, about $1 per week for a yearly subscription. Complete entries for Sunday's state championships at Ponaganset. Complete list of entries for Sunday's state championships at Ponaganset. The Rams are heavily favored to sweep the boys' and girls' titles at Sunday's state championships.